Paratesticular region; Tumors; Benign Neoplasms; Rhabdomyosarcoma, Embryonal; Immunohistochemistry. Objectives: Tumors and tumor-like lesions (TLL) of the paratesticular region are rare. Very few studies depicting the spectrum of lesions of this location are available in the literature. Malignant neoplasms arising in the paratesticular region represent only 7.0% of malignant tumors presenting as a scrotal mass. TLL and benign tumors are of great interest, because of their topography they can simulate a neoplasm in the paratesticular structures. We sought to study the incidence, nature, pattern, clinical, immune, and histopathological characteristics of tumors and TLL of the paratestis. Methods: In this six-year study, records of the cases were reviewed and the histopathology slides were reassessed. Blocks were retrieved and stained immunohistochemically for relevant markers. Results: A total of 47 cases of tumor and TLL of the paratestis were diagnosed over a six-year period. The patients ranged from one to 76 years old and most presented with a scrotal mass. Of these, seven (14.9%) were benign. Lipoma was the most common benign tumor. One case each of adenomatoid tumor, scrotal hemangioma, solitary fibrous tumor, and papillary cyst adenoma were reported. The TLL (70.2%) comprised of 17 cases of epididymal cyst, seven cases of tuberculous epididymitis, four cases of filarial epididymitis, two cases each of non-specific granulomatous epididymitis and fibromatous periorchitis, and one case of mesothelial cyst. Seven malignant tumors (14.9%) were diagnosed all of which were sarcomas. All seven were primary to the paratesticular region. The most common malignant tumor was embryonal rhabdomyosarcoma. One case each of malignant mesothelioma, malignant fibrous histiocytoma, atypical lipomatous tumor/well-differentiated liposarcoma, and myxoid liposarcoma were identified. Conclusion: Neoplasms of the paratesticular region affect patients of all ages, with potentially life-threatening sequelae. Awareness of the entire spectrum and meticulous histopathological examination and immunohistochemical studies are of prime importance in the diagnosis of the various lesions as these influence the mode of therapy and subsequent prognosis of the patient. Paratesticular tumors (PT) are intrascrotal tumors that arise from the epididymis and the spermatic cord and its coverings. A wide variety of paratesticular cysts and tumors, though rare, may present as intrascrotal inguinal masses.1 Precise diagnosis of these lesions is difficult in the pre- and intraoperative stages. Very few studies depicting the spectrum of lesions of this location are available in the literature. Awareness of the various lesions, through histomorphology and immunohistochemistry (IHC), play a vital role in the diagnostic assessment and, therefore, in the prognosis and management of patients with paratesticular masses. Here we present the various tumor and tumor-like lesions (TLL) of the paratestis. Our study was carried out in a tertiary care hospital over a period of six years between 2000 and 2005. The cases studied were obtained from records of the pathology department. Follow-up data was not available. All the tissue specimens were formalin fixed and paraffin embedded. Hematoxylin and eosin stained sections were examined microscopically. Periodic acid-Schiff (PAS) and alcian blue staining and relevant IHC analysis (including desmin, actin, myogenin, and vimentin) were done wherever necessary (outsourced to Medilab, India). Cases of recurrent tumors were excluded from analysis. We classified the tumors based on the World Health Organization (WHO) 1998 classification of testicular tumors. Of the 49,934 histopathological specimens received, 47 were PT and TLL (0.1%) [Table 1]. There were 2,060 male malignancies in total making paratesticular neoplasms account for 0.6% of all cancers in men. Of the 319 malignant tumors of the urogenital system in males, seven cases of malignant paratesticular tumors (2.2%) were encountered. Of the 98 scrotal masses, PT and TLL constituted 48.0%. Out of 47 PT and TLL, seven were malignant tumors (14.9%), seven were benign (14.9%), and 33 were TLL (70.2%). The most common paratesticular malignant tumor was embryonal rhabdomyosarcoma (ERh) (6.4%) [Figure 1a]. 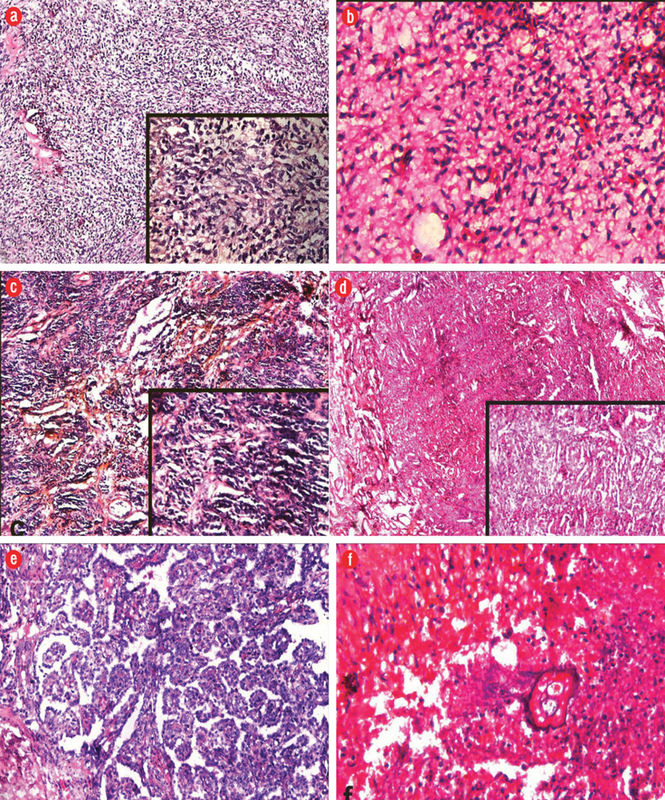 One case each of malignant fibrous histiocytoma, myxoid liposarcoma [Figure 1b], atypical lipomatous tumor/well-differentiated liposarcoma (ALT/WDL), and malignant mesothelioma were identified. The most common paratesticular TLL was epididymal cyst (36.2%) followed by tuberculous epididymitis (14.9%) [Figure 1c]. Four cases of filarial epididymitis, two cases each of non-specific granulomatous epididymitis and fibromatous periorchitis [Figure 1d] and one case of mesothelial cyst were reported. The most common paratesticular benign tumor was lipoma (6.4%). One case each of adenomatoid tumor, scrotal hemangioma, solitary fibrous tumor, and papillary cyst adenoma were reported. Maximum PT were seen in the 31–40 years age group (28.5%). The youngest patient was a one-year-old with paratesticular ERh [Figure 2a]. The oldest patient was 76 years old with malignant fibrous histiocytoma. 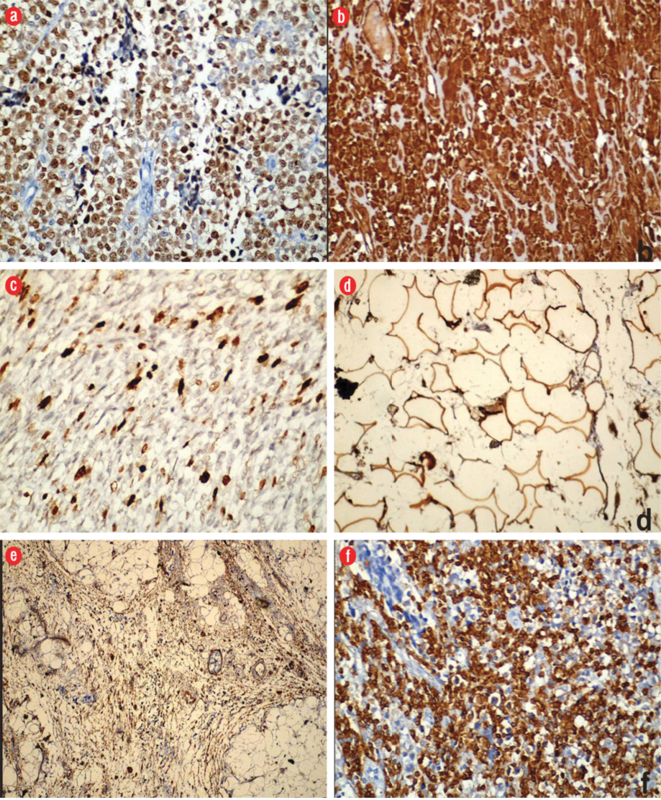 Myxoid liposarcoma [Figure 2b] and desmoplastic variant of malignant mesothelioma [Figure 2c] were seen in a 55- and 30-year-old male, respectively. The highest number of paratesticular TLL were seen in the 41–50 years age group (23.0%). Most cases presented with testicular mass. The epididymis was the most common site of origin for PT (28.6%) [Table 2] and TLL (90.9%) [Table 1]. Adenomatoid tumor [Figure 2d] and papillarycystadenoma [Figure 2e] were seen arising from the epididymis. Four cases of filarial epididymitis were also noted [Figure 2f]. The most common tumor in the pediatric population was ERh. 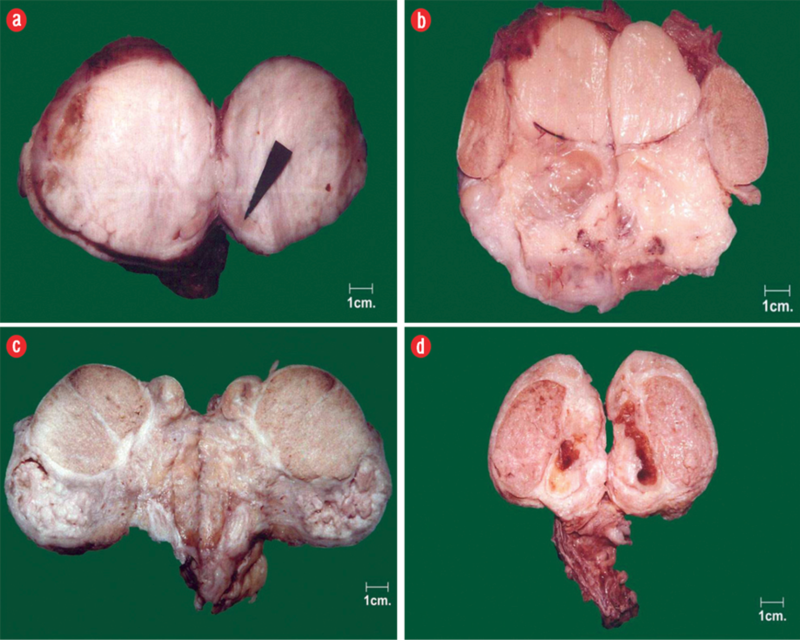 Out of the three paratesticular ERh cases, one case had inguinal lymph node metastasis at the time of presentation, and one had cerebral metastasis diagnosed with a computed tomography (CT) scan of head and neck. In all the three cases, fine needle aspiration cytology (FNAC) established the diagnosis, which was later confirmed on histopathological examination. FNAC in all three cases showed a hypercellular smear composed of small cells with hyperchromatic nuclei and scanty cytoplasm. Multinucleated and spindly cells were also noted. In two cases, the entire tumor was available for examination. The tumors were 7 cm × 6 cm × 5 cm and 4 cm × 4 cm × 3 cm in size. In the third case, a Tru-cut biopsy was available to confirm the cytological diagnosis. Immunostains were positive for desmin, actin, myogenin [Figure 3a], and vimentin in all three cases. The tumor cells in malignant fibrous histiocytoma showed cytoplasmic immunoreactivity for vimentin [Figure 3b] with a Ki-67 labeling index of 30.0% [Figure 3c]. The tumor cells for myxoid liposarcoma showed membrane immunoreactivity for S100 protein [Figure 3d] and the atypical cells scattered within the varying sized lipogenic cells of ALT/WDL showed CD34 immunoreactivity [Figure 3e]. The tumor cells of malignant mesothelioma showed nuclear and cytoplasmic immunoreactivity for calretinin [Figure 3f]. Mucin droplets in malignant mesothelioma were alcian blue positive and PAS negative. Stromal mucin in myxoid liposarcoma was alcian blue positive. One case of papillary cystadenoma of the epididymis was found in a 32-year-old patient with Von-Hippel-Lindau (VHL) disease. Figure 1: Gross photomicrograph of (a) paratesticular rhabdomyosarcoma, (b) paratesticular liposarcoma, (c) tuberculous epididymitis fibromatous periorchitis, and (d) fibromatous periorchitis. Figure 2: Photomicrographs of hematoxylin (blue) and eosin (red/pink) staining of (a) paratesticular rhabdomyosarcoma showing numerous small round cells at places showing spindling (inset), magnification = 400 ×, and cells with round to oval nucleus and scanty to moderate amount of eosinophilic cytoplasm, magnification = 100 ×. (b) Paratesticular liposarcoma showing nests of tumor cells (round to oval) in myxoid matrix with delicate plexiform capillary vascular network, magnification = 400 ×. (c) Malignant mesothelioma showing nests of tumor cells, magnification = 100 ×, round to oval cells having a hyperchromatic nucleus and scanty cytoplasm (inset), magnification = 400 ×. (d) Adenomatoid tumor of epididymis showing small spaces, magnification = 100 ×. Tubules lined by flattened epithelium in a fibrous stroma (inset), magnification = 400 ×. (e) Papillary cystadenoma of the epididymis showing cysts with papillae projecting into the lumen, magnification = 400 ×. (f) Filarial epididymitis showing necrotizing granuloma with a filarial worm at the center, magnification = 400 ×. Figure 3: (a) Embryonal rhabdomyosarcoma: tumor cells showing immunoreactivity for myogenin, magnification = 400 ×. (b) Malignant fibrous histiocytoma: tumor cells showing immunoreactivity for vimentin and (c) Ki-67, magnification = 400 ×. (d) Myxoid liposarcoma: tumor cells showing immunoreactivity for S100 protein, magnification = 400 ×. (e) Atypical lipomatous tumor: atypical cells showing immunoreactivity for CD34, magnification = 100 ×, and (f) malignant mesothelioma: tumor cells showing immunoreactivity for calretinin, magnification = 400 ×. Table 1: Distribution of paratesticular tumor and tumor-like lesions. Table 2: Site distribution of paratesticular tumors. The paratesticular region includes the contents of the spermatic cord, testicular tunics, the epididymis, and vestigial remnants (e.g., the appendices epididymis and testis).2 Histologically, this area is composed of a variety of epithelial, mesothelial, and mesenchymal elements. Therefore, neoplasms arising from this region form a heterogeneous group of tumors with different behavioral patterns.3 On rare occasions, a tumor from a distant site can metastasize to the paratesticular region.4 Pseudotumors or tumor-like proliferations and benign mimickers are seen in paratesticular structures.5 Awareness of these lesions can help better patient care. The most common benign tumor of the paratestis was lipoma in our study. A total of three cases (42.9%) were reported, two in the spermatic cord and one in the epididymis. The adenomatoid tumor is the most common tumor of the epididymis.10,11 It was first described in 1945 by Golden et al,10 and is regarded as a distinctive benign mesothelial neoplasm. The differential diagnosis includes metastatic carcinoma, malignant mesothelioma, histiocytoid hemangioma, and carcinoma of the rete testis. IHC confirmation with a mesothelial marker such as calretinin is helpful in the differential with non-mesothelial lesions.10,11 In our study, one case was reported in a 34-year-old. On gross examination, the mass was a brownish-white nodular specimen measuring 2 cm in diameter, and cut sections had a solid, firm and brownish white appearance. Scrotal hemangiomas are extremely rare, comprising less than 1% of all hemangiomas. They usually manifest in infants and occasionally in later childhood or adolescence. Microscopic analysis reveals capillary, cavernous, or arteriovenous types.12 One case of scrotal hemangioma arising from the tail of the epididymis was reported in a 32-year-old in the present study. Papillary cystadenoma is a rare benign neoplasm of the epididymis. It was first described by Sherrick in 1956.13 More than one-third of the cases reported in the literature have occurred in patients with VHL disease. The pathogenesis involves loss of the VHL gene resulting in overexpression of the angiogenic protein “hypoxia-inducible factor.” Histologically, papillary cystadenoma is characterized by cystic spaces with intracystic papillary projections lined by clear cells. These cells are positive for cytokeratin AE1/AE3, epithelial membrane antigen (EMA), and CK7, and negative for CK20 and renal cell carcinoma (RCC) immunostain.13 Treatment consists of surgical excision, and the prognosis is excellent. One such case was reported in the present study in a 32-year-old patient with VHL disease. Paratesticular sarcomas are rare and account for less than 1% of all adult sarcomas. Intrascrotal tumors can be testicular or paratesticular. PT are rarer (7–10%). Only 30% of PT are malignant, and 90% of these are sarcomas. Published series of sarcomas have identified leiomyosarcoma (32%) as the most common malignant soft tissue tumor in this region, followed by rhabdomyosarcomas (24%) and liposarcomas (20%). Recurrence is frequent in PT sarcomas and can occur years after the initial diagnosis.14 ERh was the most common malignant tumor reported in our study. Individual cases of ALT/WDL, myxoid liposarcoma, malignant fibrous histiocytoma, and malignant mesothelioma were also noted. Paratesticular mesotheliomas are rare tumors, accounting for around 0.3% to 1.4% of all cases of malignant mesotheliomas. They are known to be aggressive tumors. Barbera and Rubino first described it in 1957.21 Almost half of the patients have been reported to develop recurrence or metastasis after radical orchiectomy for paratesticular malignant mesothelioma. Calretinin [Figure 3f] and CK5/6 usually help in confirming the diagnosis.21 One case of malignant mesothelioma was reported in our study in a 30-year-old patient measuring 12 cm × 9 cm × 4 cm [Figure 2c, inset]. Paratesticular sarcomas are an extremely rare entity, and even in a large institution it is difficult to accumulate sufficient cases to document the history of such tumors. Hence, documentation of such rare tumors becomes essential. The first manifestation of genitourinary tuberculosis in males is epididymo-orchitis. This may produce diagnostic difficulty for the clinician to exclude the possibility of testicular neoplasm. Tuberculosis as a cause of scrotal swelling should be considered even in the absence of history of tuberculosis and in the absence of radiological or bacteriological evidence of infection. A diagnostic workup in young men with swollen testicles should be thorough to avoid an unnecessary orchiectomy. A diagnostic algorithm, which should include minimally invasive diagnostic approaches, such as needle biopsy, might be effective for accurate diagnosis.23 Seven cases of tuberculous epididymitis were reported in our study in the 21 to 50 year age group. In six cases, incisional biopsy was performed to arrive at an accurate diagnosis. However, one case resulted in unnecessary orchiectomy. Fibromatous periorchitis exhibits diffuse proliferative encasement of the testis and manifests grossly as an indurated testis reminiscent of malignancy. These comprise approximately 6% of PT lesions, and are accepted as reactive lesions secondary to trauma, hydrocoele, infections, or inflammation. Clinically these lesions mimic malignancy resulting in treatment by radical orchiectomy as seen in our cases. Fibromatous periorchitis should be considered in the differential diagnosis when one encounters a predominantly fibrocollagenous lesion.25 Two such cases were reported in a 26- and a 34-year-old in our study. Mesothelial cysts may arise from the tunica vaginalis, tunica albuginea or less commonly in the epididymis or spermatic cord. They may be single or multiple measuring about 2.5 cm in diameter and are lined by single layer of cuboidal to flattened mesothelium.26 One case was reported in our study in a 47-year-old. In conclusion, the paratesticular masses comprise of a variety of neoplastic as well as non-neoplastic lesions. Sarcomas comprise a significant part of paratesticular masses and may exhibit an aggressive clinical course. Children are predominantly affected by paratesticular rhabdomyosarcoma. The older patients are affected by a variety of cysts, benign neoplasms, and malignancies. Awareness of the entire spectrum with meticulous immune and histopathological examination is of prime importance in the diagnosis of the various lesions as this influence the mode of therapy and subsequent prognosis of the patient. Rodríguez D, Olumi AF. Management of spermatic cord tumors: a rare urologic malignancy. Ther Adv Urol 2012 Dec;4(6):325-334. Makhdoomi R, Bashir H, Muanfat M, Baba KM. Primary paratesticular carcinoid in a 70-year-old male. Cent European J Urol 2012;65(1):45-47. Gupta S, Misra V, Singh PA. Alveolar rhabdomyosarcoma of paratesticular tissue in an adult. Journal of Clinical and Diagnostic Research 2010 Feb;4(1):2068-2070. Gomes CA, Junior CS, de Assis EA, de Souza Silva TA, Faquin CM, de Paula Vilela L, et al. Metastatic and Synchronous Melanoma in the Testicle and Paratesticular Region. J Clin Exp Dermatol Res 2012;3(2):139. Algaba F, Mikuz G, Boccon-Gibod L, Trias I, Arce Y, Montironi R, et al. Pseudoneoplastic lesions of the testis and paratesticular structures. Virchows Arch 2007 Dec;451(6):987-997. Jayaram N, Ramaprasad AV, Chethan M, Sujay RP. Tumours and tumour-like conditions of the para-testicular region–a study of morphological features. Indian J Pathol Microbiol 1998 Jul;41(3):287-295. Srigley JR, Hartwick RW. Tumors and cysts of the paratesticular region. Pathol Annu 1990;25(Pt 2):51-108. Unlü Y, Huq GE, Ozyalvaçli G, Zengin M, Koca SB, Yücetas U, et al. Paratesticular sarcomas: A report of seven cases. Oncol Lett 2015 Jan;9(1):308-312. Barazani Y, Tareen B. Rare case of paratesticular solitary fibrous tumour (lipomatous hemangiopericytoma). Can Urol Assoc J 2012 Jun;6(3):E131-E133. Kontos S, Fokitis I, Karakosta A, Koritsiadis G, Mitsios K, Koutsikos S, et al. Adenomatoid tumor of epididymidis: A case report. Cases J 2008;1(1):206. Pacheco AJ, Torres JL, de la Guardia FV, Arrabal Polo MA, Gómez AZ. Intraparenchymatous adenomatoid tumor dependent on the rete testis: A case report and review of literature. Indian J Urol 2009 Jan;25(1):126-128. Akbar SA, Sayyed TA, Jafri SZ, Hasteh F, Neill JS. Multimodality imaging of paratesticular neoplasms and their rare mimics. Radiographics 2003 Nov-Dec;23(6):1461-1476. Toutziaris C, Kampantais S, Perdikis I, Gourvas V, Laskaridis L, Gkagkalidis K, et al. Papillary cystadenoma of epididymis: Is there a need for further investigation in unilateral cases? Int J Surg Case Rep 2013;4(7):616-618. Matias M, Carvalho M, Xavier L, Teixeira JA. Paratesticular sarcomas: two cases with different evolutions. BMJ Case Rep 2014 Aug 21;2014. Resim S, Okur N, Bakar SS, Kilic A, Altunoluk B. Paratesticular Embryonal Rhabdomyosarcoma; Report of a Case. Iranian Journal of Pediatrics, Tehran, Iran, 19, Dec. 2009. Sefa R, Nazan O, Sevgi B, Ali OK, Bulent A. Paratesticular Embryonal Rhabdomyosarcoma: Report of a Case. Iran J Pediat 2009;19:430-434. Pinto RG, Menezes MA, Pai Vernekar S. FNAC of Paratesticular Embryonal Rhabdomyosarcoma – A Study of 3 Cases. J Cryptol 2005;22(3):130-131. Agarwal PK, Palmer JS. Testicular and paratesticular neoplasms in prepubertal males. J Urol 2006 Sep;176(3):875-881. Alyousef H, Osman EM, Gomha MA. Paratesticular liposarcoma: a case report and review of the literature. Case Rep Urol 2013;2013:806289. Padula GD, Schmitz M. Adult paratesticular malignant fibrous histiocytoma treated with surgery, systemic chemotherapy and postoperative adjuvant radiotherapy. J Cancer Res Ther 2006 Oct-Dec;2(4):201-202. Esen T, Acar O, Peker K, Sarman K, Musaoglu A, Tefekli A. Malignant Mesothelioma of the Tunica Vaginalis: Presenting with Intermittent Scrotal Pain and Hydrocele. Case Reports in Medicine 2012;2012:189170. Erikci V, Hoşgör M, Aksoy N, Okur Ö, Yildiz M, Dursun A, et al. Management of epididymal cysts in childhood. J Pediatr Surg 2013 Oct;48(10):2153-2156. Papadopoulos A, Bartziokas K, Morphopoulos G, Anastasiadis A, Makris D. A rare case of isolated tuberculous epididymitis in a young man presenting with a swollen testicle. OA Case Reports 2013;2:3. Barreto SG, Rodrigues J, Pinto RG. Filarial granuloma of the testicular tunic mimicking a testicular neoplasm: a case report. J Med Case Rep 2008;2:321. Minhas K, Barakzai A, Qureshi A. Fibromatous periorchitis. J Pak Med Assoc 2009 Jan;59(1):47-49. Rao SN, Diaz E, Prabhu S, Susheel Kumar TK, Jose P. Mesothelial cyst of epididymis - a rare presentation. Indian J Urol 2002;18(2):175-176. Medina Pérez M, Valero Puerta JA, Martínez Igarzabal MJ. [Non-specific granulomatous epididymitis]. Arch Esp Urol 2000 May;53(4):383-384.